Index of Subjects, Click on subject link for access. New Owners, I would like to use this thread to give you some of the most important information about your Slingshot in my opinion. Most information presented is in your owners manual. I will also present tools used in performing maintenance. I encourage you to read the Owners Manual. 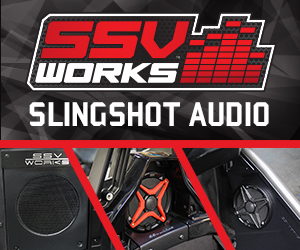 Here is a link for the 2015 and 2017 Slingshot Owners Manual for access quickly. If anyone can give me a PDF Link, I will place here for other years. I could only find these issues online. New Owners, I know the feeling you had when you took possession of the keys. Here is a video of our First Slingshot Pickup and drive for the first time. I still remember the feeling, and I have it captured. Edited 43 times, last by samowens44: want to add a video to thread beginning ( Jan 8th 2019 ). The first thing new owners want to do after getting used to enjoying the first rides and the excitement of owning a Polaris Slingshot. You have discovered you get questions all the time as you travel around and park. Once you get through this period, you will start wondering about accessories and what is available and how will your warranty be affected. Also, the title of this Post is Fueling the Slingshot. So here is my information about these subjects and what Polaris Says about it. @samowens44 with new owners purchasing new and used can you post links to all - not just one year? The Polaris Slingshot has a specific way to check the oil that may be different than what you know from driving your vehicle and vehicles over the years. Look at the procedure for checking your oil level on the Polaris Slingshot. It is in the Owners Manual and here is the area highlighted for you. Now I am also highlighting the Pre-Ride Inspections. Yes Polaris recommends you do this total check each time before you drive your slingshot. I am point out one item, the Engine Oil Level Check. Folks this is suggested, but if you drive the slingshot without any coolant in the system and you restore the engine, Polaris will show you this pre-ride inspections area and if you had done it your engine would not be restored. Just letting you know you have responsibility to keep all levels proper for your warranty to be in effect. Knowledge is your best friend, read the Owners manual. Yes, will work on that, it will make it easy for all members to find information needed to operate and maintain their Slingshot within the proper way Polaris recommends. Thanks for the comment. Yes, Edward, I may do a special post on that issue and want help forum all with what to list for their first ads. I welcome our members to post in this thread on what has been posted so far. Let's build their experience in levels. I still have a lot of basic task I want to post here. Thanks for that idea. In this thread, all post are from information in the 2017 Owners Manual, some years may be different. Always check your year owners manual for your Slingshot for proper information. Changes may be made from year to year. Elevating the Slingshot, getting it in the air to have access underneath. There are not too many reasons you need to go under the Slingshot to perform most Maintenance and if you do need access it is only necessary for your arms to reach areas of importance. There are requirements of raising the rear wheel for checking the Drive Belt Adjustments. You will not find a recommended way of raising the rear wheel in the Owners Manual. I do show how I raise the rear wheel to check and make adjustments to the Drive Belt in my several video dealing with the Drive Belt. Cleaning the wheels and rims is a valid reason to raise the vehicle. It sure makes it an easy task. Yes, I have a video on the subject. Here is the Polaris Slingshot recommended places to raise your Slingshot. Edited once, last by samowens44 ( Aug 31st 2018 ). As new Owners arrive to the forefront of our new exciting sport, "Slinging", they are will be exploring towing the slingshot. Trailers will be covered in a special post, but for now, folks may have a trailer that will fit the Slingshot. Tying down the Slingshot is important to do correctly. There are a number of different system of tie down systems. I am only going to show what the owners manual covers for towing. If you want to do a different system this will be a question to present to the forum and folks will show their experiences. I use this system for tie down and have used it for over 15,000 miles of trailer across the nation. Some people think of tow dolly's as an option for towing the Slingshot, Polaris addresses this option in their towing information. This will be a good place to make note to using your year Owners Manual for proper points for your vehicle. There is no way I can post every option for all years. I am posting only 2017 year Slingshot information. I will post this at the beginning of this thread. Thanks Ross. Here is one thing that may save you from a tow truck. You may run out of gas with your exciting ride. You may get a can of gas and think all is well, I will be home soon. You need to know this information before you run out of gas. How to prime the fuel system when you have reached this point. This information is in the 2017 Owners Manual, check your year in case there may be differences. Prepare for the unexpected, read the owners manual. You do not want to be without the proper knowledge to get on the road with the least delay. Taking a break, much more to come! If you are a guest viewing this, become a member and start posting your issues, questions, and input with your knowledge. Yes, we want to know what issues you have had, or anything that will help all our family members. Thanks for viewing. More information for all that will be of great value is the Error Code Display. Again, this is all in your Owners Manual. Be sure to check your year model, all my displays of information are from 2017 models. Most stuff will be the same, but check and read your manual. I mean it, it is well worth the effort. Now when that error check engine light comes on, you will know how to isolate the problem. When you get the code and don't have a list of the codes, just post a thread to ask for help. You may get someone that know just what to do to fix it. Be prepared and always ready for the unexpected. I know the sales guy did not go over how to set the clock on the Slingshot. Well here is the procedure, it is in the owners manual. Don't drive around with the clock wrong. Someone is going to say, clock, I did not know there was a clock where is it. At the bottom of the speedometer under the odometer. Now set that clock! This condition may come up in some cases of getting ready to leave and get distracted and leave the key in the on position and come back later to find your power assistance does not work and you have a EPAS lamp lite. You may be out somewhere and feel like it is unsafe to drive and call a tow truck. Be ready for this condition, it has happened to a lot of folks and it is alarming at first. Now you will know what to do. This again is in the Manual. Here is what that button below the Mode button on the console does and how it does it. Watch the video and get a full understanding of two features it controls. For your safety, you should understand these features and how they effect the stability of your Slingshot before using this control button. 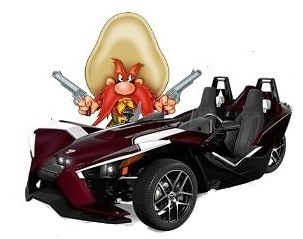 Your Slingshot has 3 wheels and not 4. This makes the Slingshot less controllable under certain condition that require the special Stability Control system. It helps control the intended direction of steering to complete the direction as safe as possible. There is software that is monitoring your steering and when conditions are out of limits, the program uses the ABS Braking and engine power control to interact to keep you in a safe path. When you depress this control button, you are taking this software out of the control and you are less safe for your driving experience. The average driver should not use this button, it is there for special performance driving conditions to perform special performance actions. Mainly "Drifting" Performance Driving. This would not be a legal street driving condition, but used on a special track competition. Here is your Owners Manual section on ESP. Folks, these features will not protect you under every condition you drive under. You still have to maintain a safe driving attitude. You will not be protected by unsafe driving practices. Please read carefully the attached documents from the Owners Manual. Very important, the ESP will not be effective under Hydroplaning conditions, so when you see water in the road ahead, slow down and be ready for the effects, there are no controls you can apply that will work. Your best plan is to be ready to avoid this condition. Edited once, last by samowens44 ( Sep 5th 2018 ). As a new owner enjoys the newness of their Slingshot and all the attention that goes with it, here is an area that is important and may help with a power issue. The most common problem that can happen to new owners is plugging in a device, charger, or high energy product that blows the fuse supplying power because of too much current draw. Plugging a Tire Pressure tool into the power port can draw too much current. At first you may not no what to do, with a understanding of where the fuses are located, how to find and check the fuse will allow you to troubleshoot the circuit with ease. Replace blown fuse and be back in business. Here is a video that will help with this issue. I show using a volt meter, you can use a test light to check the fuse for proper operation. Good Luck and be prepared. Knowledge is your best friend for the unexpected! 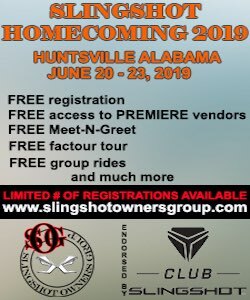 @samowens44 your work & videos have been very helpful to me as I have made my decision to purchase a 2019 slingshot. Hope that you will continue to update your helpful info for those of us with newer models! The smarter you get, the funnier I am.